Over 10,000 people gathered as the sun set on Guildhall Square in the heart of the city for one of the biggest street events Southampton has ever seen. It was back in 2008 that Neil Maddock, an AOG minister first had the vision to stage a large scale outdoor Passion play in the centre of Southampton and now on Good Friday visitors of all generations gathered to listen to Southampton Passion’s all singing, all dancing retelling of the Easter story. Churches had come together to enable this production to happen with many donating rehearsal space, refreshments and support. There was a carnival atmosphere and the crowd clapped along with the songs, as well as hissing and booing at Judas. The steps of the Guildhall were an excellent setting for the Easter story, and the whole play was broadcast on two giant screens. The script, songs were all written specially. Neil directed the production and then played the role of Jesus on the night. Supported by a full choir, the casts’ voices filled the whole of the centre of Southampton for this one-off performance of Jesus’ last days. 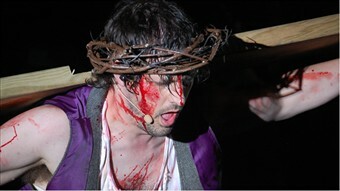 It was an incredible night that the local press labelled an “Outstanding Easter Spectacle”! Thoughts turn toward the future of this event and there is already talk of it being made available to other cities and even the possibility of the team filming a movie of the production at some point. E-QUIP Community Arts is a new charity that seeks to promote the Christian faith through the arts and offer opportunities to people from disadvantaged backgrounds to access the performing arts and seek to build confidence and self esteem.